So classes have started back and this first one I'm in is called Fundamentals where we learn basics such as knife skills, poaching fruit, creams, writing and doing filigrees in chocolate. It's actually pretty easy going and I enjoy it. Today we worked more with writing and creating our own filigrees in chocolate. I tried to do a diamond and despite my bag being stupid a few turned out nicely. 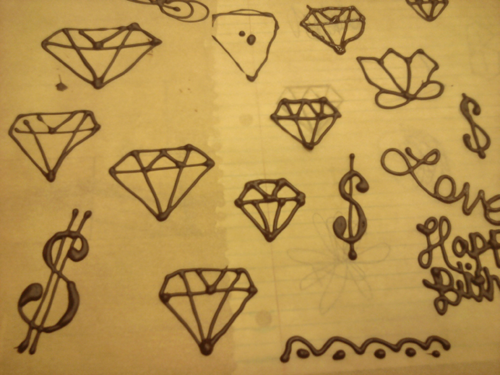 The teacher saw where I drew up the diamond as practice and said I should do a dollar sign so I whipped one up free style. Well I need to get a move on the paper I have to write for this class. We picked a random piece of paper that had a fruit on it and I got blackberries so I'm learning a lot about the fruit. Hope everyone's week is going well so far!